A new report offers a picture claimed to be the front glass panel for Apple's next iPad, and also claims the third-generation device will feature Siri voice control, a dual-core "A5X" processor, and a 1080p camera with image stabilization. The details were scoured from a Chinese microblogging site and shared by Apple.pro on Tuesday (via Google Translate). Included with the details is a purported "iPad 3" 9.7-inch front glass panel showing a design largely unchanged from the current iPad 2, though the new part does feature a longer ribbon cable than its predecessor. But the repot also includes alleged details about Apple's anticipated third-generation iPad, claiming that the A5X processor pictured recently on a leaked logic board is in fact a dual-core processor. It also said that the new, upgraded CPU will support Siri, bringing Apple's personal assistant software to its second device beyond the iPhone 4S. The report also claims that the next iPad will sport a 1080p camera with image stabilization, something that is also available on the iPhone 4S. 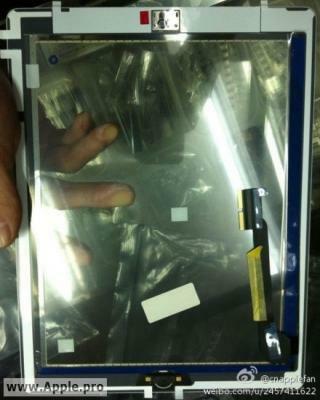 Other leaked rear panels claimed to be for the next iPad have shown space for a larger camera lens, in addition to slightly more tapered edges. Tuesday's report also claims that the third-generation iPad will ship with iOS 5.1, and will arrive in the U.S. in mid-March, soon after its anticipated introduction on March 7. The next iPad is expected to become available in Japan, the U.K, France and Germany in April, with Hong Kong to follow soon after. Finally, the site also reaffirms the mounting evidence that Apple's next iPad will include a high-resolution Retina Display. The screen is expected to double the resolution of the current 1,024-by-768-pixel iPad to 2,048-by-1,536 pixels. Components and details of Apple's next iPad have flooded the Web in recent days, signaling that production of the device is likely well underway ahead of a rumored media event in early March. That's in line with last year's iPad 2 event, which was held the first week in March.